The Esbit 16 x 5 g solid fuel cubes have a burn time of approximately 7 minutes and each box includes 16 cubes. They have a strong heat output, ignite with a match or lighter and lightweight and compact. 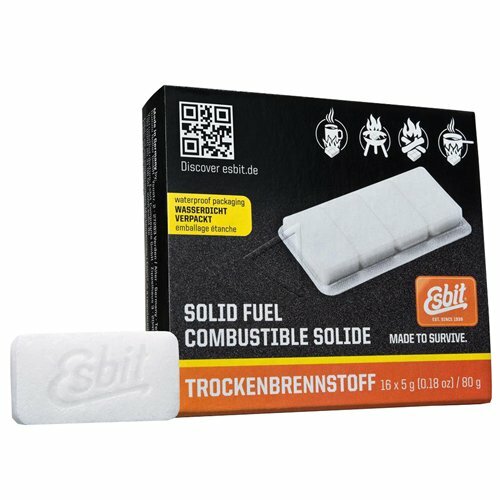 When stored properly, Esbit solid fuel mantains its full functionality for many years. It works also at temperatures below 32° F and in high altitudes. It is easy to handle and simple technique which cannot fail. It has no visible smoke and leaves almost no ash after burning. It is used by various NATO forces, expeditions, in the aftermath of disasters. Also used to operate toy steam engines and other hobby items. Works at high altitudes and sub-zero temperatures. Each 5 g tablet burns approximately 7 minutes and up to 1400°F (760°C). Includes 16 tablets that are individually packed in waterproof packaging.